Is your water tank on its last wheeze? Or maybe you’re just tired of waiting hours and hours for it to refill. Whatever your reasons for considering a switch to natural gas tankless water heaters, I’m here to tell you that you’re on the right track to a better, more convenient life. 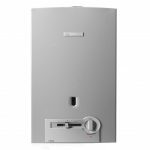 What Are Natural Gas Tankless Water Heaters? In traditional homes, hot water is stored in a giant water tank and supplied to sinks and showers whenever the tap is turned on. While this is the “regular” way, the unquestioned way, it also comes with significant drawbacks. For example, you may have to wait a long time for a depleted tank to refill, or you may have a sky-high utility bill because the water tank has to keep your stores constantly heated. A tankless water heater removes the tank from the equation entirely. Instead of storing hot water in a separate location, you’ll simply heat cold water as it flows through your pipes. It’s faster, more hygienic and more energy-efficient than traditional water tanks. Natural gas and propane models use live flames to warm heating coils located within the unit. Electric units warm their coils with electricity. While each type has its benefits, I personally recommend natural gas models to all my customers. Not only are they stronger and more powerful on the whole, but they’re also the most like traditional water tanks, so they make it easy for first-timers to switch. That said, there is a con to every pro, so let’s take a look at some of the benefits and drawbacks of natural gas tankless water heaters. Power: Natural gas units can provide twice or even three times as much power as electric units. This is measured in gallons per minute (GPM). Convenience: The best natural gas tankless water heater is a “whole house” unit, and if you buy one of them, it’s the only one you’ll need for a long, long time. When properly maintained, they can last for 20 years or more. Cleanliness: Water stored in tanks can pick up dirt, rust and other sediments leaking from the tank itself. This is a non-issue with tankless water heaters that require no tank at all. Flow: Never again will you have to worry about running out of hot water during a luxurious shower. Since tankless water heaters warm up cold water as it flows through your pipes, you could theoretically let it flow forever without interruption. Venting: Since natural gas units operate with a live flame, they emit fumes that must be vented to keep your home safe. Sometimes venting can be a costly or time-consuming effort. Price: Speaking of cost, natural gas tankless water heaters are more expensive than electric ones. They last longer and are more powerful, so they’re worth more money. Maintenance: You can’t just install a natural gas unit and forget about it. You need to keep an eye on it to make sure it’s working, venting and regulating properly. As you can see, there’s a lot to consider when you go shopping for a tankless water heater, and it certainly isn’t a decision to be made lightly. In that respect, I’ve compiled some natural gas tankless water heater reviews to help you make up your mind. I divided them by function to make it easier to compare and contrast. Go forth and choose wisely! With a max flow rate of 6.6 GPM, this natural gas unit can serve up to 3-4 bathrooms at once. It’s also extremely energy-efficient, boasting an energy factor of 0.81 – 0.83 and using only 140,000 BTUs. But that may not surprise you when you realize how small and compact this model is: It’s only 19 lbs! Offering 7.5 GPM as powered by 180,00 BTUs, the RL75iN is a strong unit for the price. While it’s beaten by other models in terms of sheer force, it’s hard to find a natural gas tankless water heater as affordable as this one, so consider its slightly diminished power as a trade-off for its low cost. The RTGH-95DVLN is a prize on all fronts. With a flow rate of 9.5 GPM and an energy rating of 94 percent, it’s both powerful and energy-efficient, a combination rarely seen in HVAC systems. The one drawback is that it’s 79 lbs, the largest on this list, but no unit is flawless. 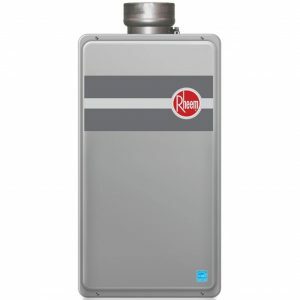 If nothing but the highest GPM will do, the RU98IN is the tankless water heater you want. It boasts a staggering 9.8 GPM! While this impressive flow rate is slightly offset by its large power requirements (199,000 BTUs), it’s to be expected from such a big (70 lbs) unit. The maximum flow capacity of the FVI-12-NG is just 4.8 GPM, a number that’s soundly beaten by other natural gas tankless water heaters on this list. 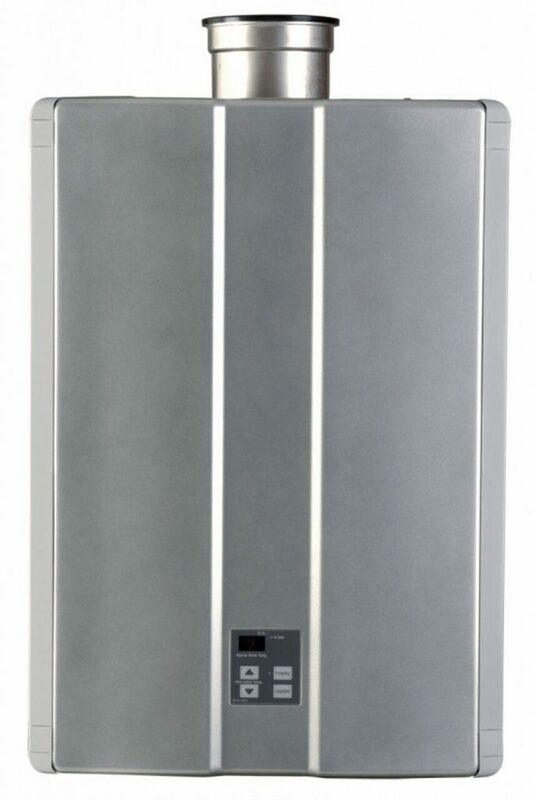 On the flip side, the unit is also one of the smallest at just 20 lbs, and it only requires 74,000 BTUs as well. Is it worth the trade? You decide. The RTG-84DVLN offers 8.4 GPM with power requirements between 11,000 – 180,000 BTUs. If these numbers seem widely ranged, that’s because they are; the blessing and the curse of the RTG-84DVLN is that its operations vary depending on use. On the plus side, it’s Energy Star certified no matter what! There’s a lot to love about the specs of the V65EN. For example, its flow rate is 6.6 GPM, so you’ll be able to enjoy it in up to 2.5 bathrooms. Its max power requirements are150,000 BTUs, and that number isn’t too shabby. It’s also a pretty compact unit at just 47 lbs, so you won’t have to wrangle with a heavy, clunky unit! As a small, compact unit, the T-KJr2-IN-NG is perfect for smaller homes and apartments. You may lose a little of the 6.6 GPM if you live somewhere larger, but don’t worry; even 3-4 GPM is enough to operate showers and dishwashers at the same time. All in all, you won’t have to worry about running out of hot water with the T-KJr2-IN-NG. The RL75iN can be installed everywhere, including commercial buildings, so don’t be afraid to hook it up in your office. You can enjoy its unlimited hot water anywhere there’s electricity! Just make sure you follow the proper installation instructions. Read more on that below. 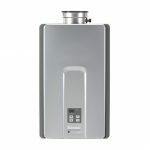 One thing you’ll see me mentioning over and over in natural gas tankless water heater reviews is the need for ventilation. Since they operate via live flame, venting is critical to prevent the build-up of harmful gases and fumes. The good news is that the RTGH-95DVLN comes with a special low-NOx system that mitigates the worst of them, so if you’re worried about safety, this is a good unit to alleviate your fears. Let’s talk about the power of the RU98IN. In addition to offering the single highest flow rate on this list (9.8 GPM), it also boasts a low-NOx system, making it a one-two punch in terms of energy efficiency. You’ll get the power to run multiple showers at once withoutsacrificing your eco-friendly lifestyle to do it. Now that’s green living! As a “point of use” unit, the FVI-12-NG works best when installed directly at the shower or sink where you want hot water. While this might mean that you need multiple units to outfit your entire home, you’ll also be getting instantaneous and unlimited hot water without delays, interruptions or interferences, and that can be priceless. No two people will have the same experience with the RTG-84DVLN. If you live in a cold climate, your unit will accommodate less use than someone who lives with moderate temperatures; if you have two bathrooms, your unit will provide more pressure than someone with three. The performance of the RTG-84DVLN will vary wildly depending on where it’s installed, so check out customer reviews before you buy. The V65EN is perfect when your hot water needs are right in the middle of the scale. It isn’t the most powerful unit on the market, but it isn’t the weakest either; it isn’t suited for castles, but it can handle more than tiny apartments, too. If you’re looking for a no-fuss tankless water heater that will get the job done without a lot of fanfare, this is the unit for you. With both inlet and outlet thermistors, the T-KJr2-IN-NG offers extremely accurate temperature control. While I generally recommend that my customers stay below 130°F to avoid burns, the unit itself can accommodate temperatures much higher than that, so if you need something 140°F or higher to wash clothes or cars, the T-KJr2-IN-NG can provide. For residential settings, the range is 98°F – 140°F. 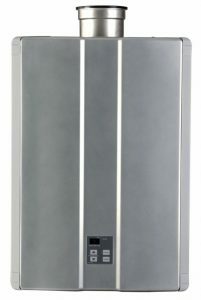 For commercial settings, the range is 98°F – 160°F. Regardless of where you put it, the RL75iN will make sure you have hot water everywhere. The RTGH-95DVLN offers a staggering 9.5 GPM, more than three times the amount of electric tankless water heaters. Even more notably, that flow rate won’t fall just because you live in a cold or elevated climate. It’s designed to withstand altitudes of 9,800 ft and above, so whether you’re relaxing in the south or freezing in the north, this unit will keep you in hot water. In residential settings, you can enjoy 98°F – 140°F. In commercial settings, you can enjoy 98°F – 185°F . 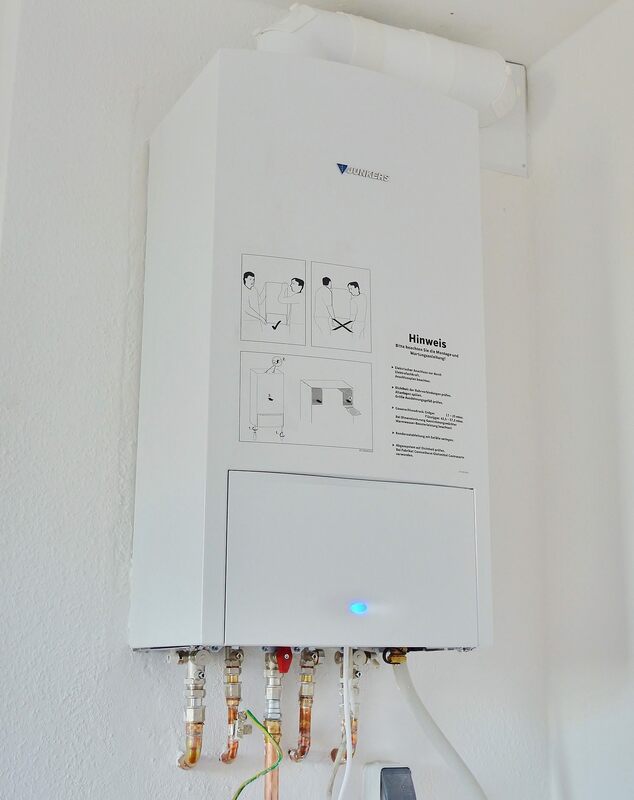 It should also be noted that the unit is pre-set with a maximum temperature of 120°F, so to make customized changes, you’ll either need to adjust the temperature controls on the box or use a special Rinnai remote control. Again, the flow capacity of the FVI-12-NG caps off at 3.4 GPM, so it isn’t a unit that can service a mansion. However, what you’ll lack in power you’ll make up for in flow. Unlike large tankless water heaters that can take up to ~30 seconds to get going, the FVI-12-NG activates at just 40 PSI, so you’ll always have hot water when you need it. The RTG-84DVLN will deliver between 6-8 GPM depending on where you live. Regardless of its exact flow rate, however, you can rest assured that it’s enough to handle the demands of most modern homeowners. Whether you’re filling a tub or doing a load of laundry, the RTG-84DVLN will see it through. This unit comes pre-set at 120°F, but that number can be adjusted by a technician to go higher. As previously mentioned, your flow rate will be a solid 6.6 GPM, so you can enjoy it in multiple bathrooms. The only real drawback of the V65EN is that it must be installed outdoors, but we’ll talk more about that down below. The T-KJr2-IN-NG is very simple to install. This is partly because of its small, compact design and partly because of its brand. 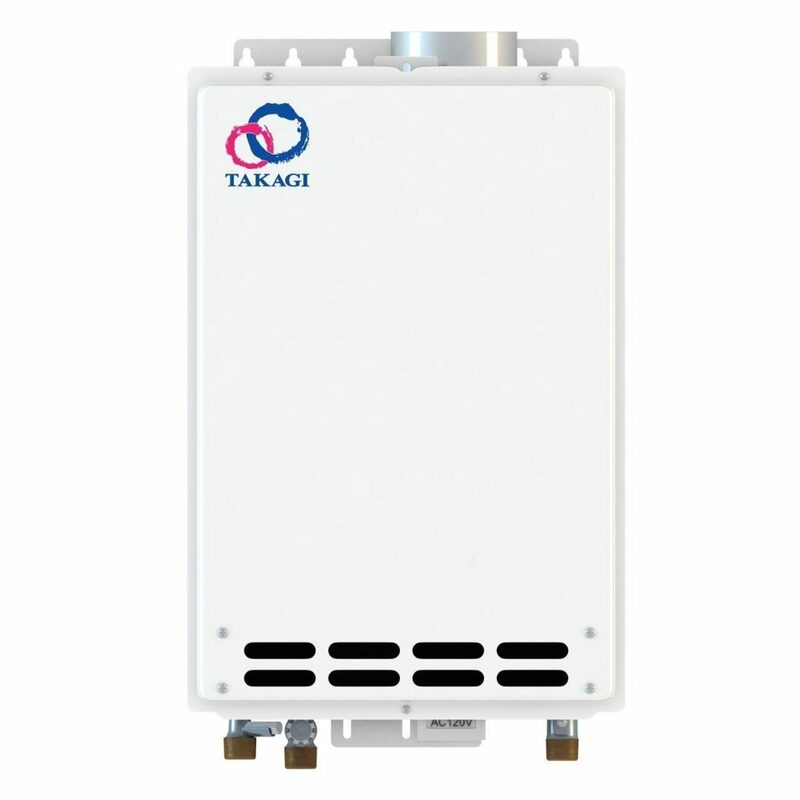 Takagi is known for its detailed instruction manuals, so you should have no problem DIYing your tankless water heater installation as long as it comes branded with the Takagi rings. Another unit that’s relatively easy to install, the Rinnai does present a slight snag in the form of its venting system. It must be vented outdoors to prevent the harmful build-up of fumes, so don’t stick it in a storage closet somewhere and forget about it. Because of its low-NOx system, the RTGH-95DVLN can be installed just about anywhere. It can also be hooked up to other units just like it so they can all function as one. 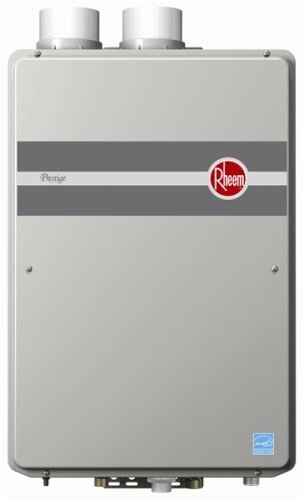 If you have extensive hot water demands, it may be worth your while to create a manifold Rheem system. As another low-NOx unit, the RU98IN can be installed both indoors and outdoors. Its internal condensing system will take care of most of the fumes. If you have any questions, however, or if you’re just not that comfortable replacing your water tank by yourself, contact Rinnai directly. While it’s my general recommendation that a trained technician handle the installation of tankless water heaters, the FVI-12-NG is such a simple, easy-to-understand model that it isn’t a great hardship to DIY. As long as you have things like ground lines and circuit breakers handy, you should be able to complete the installation yourself without a problem. The RTG-84DVLN isn’t a complicated unit, so it should be pretty easy to install. In fact, Rheem goes above and beyond to make sure the process is as painless as possible. Remote controls and thermostat wires are included with every order, and a detailed instruction manual will walk you through the installation step by step. You can only install the V65EN outdoors, so it may present a problem if you aren’t sure how to do that. A trained technician can help you, however, and Rinnai’s customer service hotline can help you find one. Call them if you have any questions about installing an exterior-mounted unit. Though it doesn’t offer the highest flow rate or the least power consumption, the Takagi T-KJr2-IN-NG is the best natural gas tankless water heater overall. It’s the kind of rock-solid unit that will give you the hot water you need for years and even decades to come. But you don’t have to take my word for it: Check it out on Amazon to see for yourself! 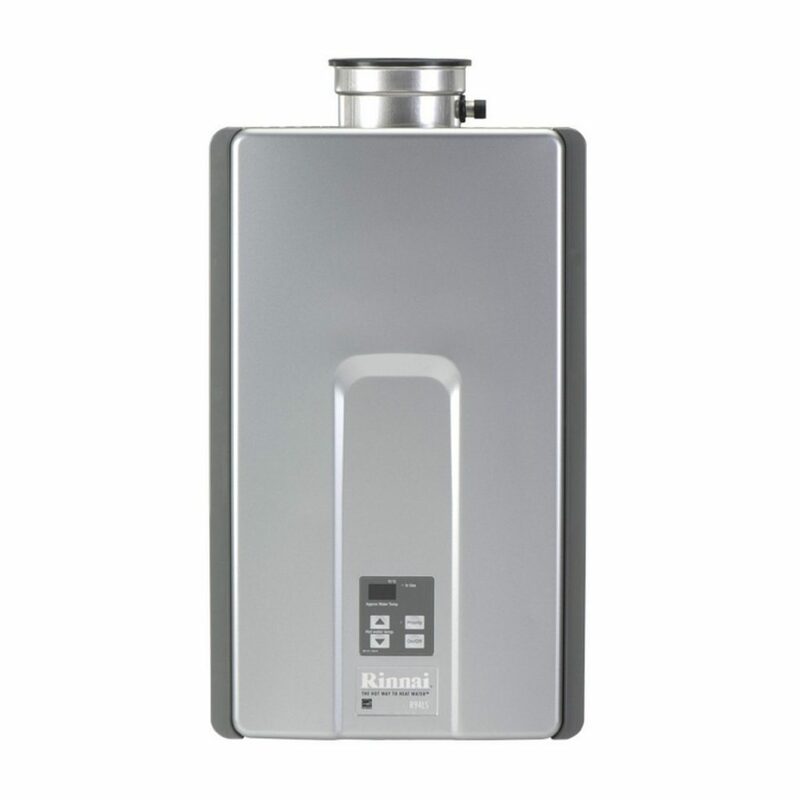 If the other model isn’t speaking to you, consider the Rinnai RL75iN instead. It’s my second-favorite in terms of utility, functionality, and affordability, and it will also last decades if properly installed and maintained. Take a look at its reviews on Amazon and tell me you aren’t intrigued by its popularity!